Most teachers want their students to be excellent. But what does that mean? Unfortunately, many teachers and schools today have a limited understanding of “excellence” as academic performance. In 2016, Cardus Education launched the John Rozema Teaching Excellence Award to discover and celebrate excellent educators within the Ontario Christian school system. Beyond academic performance, excellence includes nurturing student character, engaging the local community, and improving school culture. 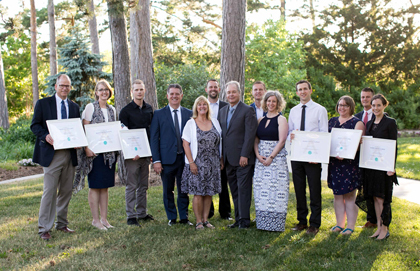 This Wednesday, over 120 honoured guests and nominees gathered at the Rock Garden of the Royal Botanical Gardens in Hamilton, Ontario for the third annual John Rozema Teacher Excellence Awards, presented in partnership with the Christian School Foundation. $28,000 was presented over the course of the evening to be used for educator’s professional development. This is the largest amount ever distributed to winners of the Rozema Awards. Convivium is proud to share videos created to learn more about the invaluable work of last night’s winners and nominees. Be sure to check out the invaluable contributions of all those educators nominated in the above categories. As we celebrate this year’s winners, we are already anticipating what treasured educators we might discover next! Earlier this year, Dr. Beth Green asked vetern educators Diane Stronks and Elco Vandergrift about the difference Christian love can make in the world’s classroom. Return to this moving interview today!